Do You Want to WIN a BRAND NEW CAR or an EXOTIC HOLIDAY Just By Thinking About it? A little while ago I decided to do a CRAZY EXPERIMENT. I wanted to PROVE that you can use the Law of Attraction to WIN A CAR. For my experiment I found a volunteer that had already watched The Secret, but was really struggling to get any positive results using the Law of Attraction. To help her win a brand new car (and later a holiday) I guided her though a simple process (That I reveal in my book 'Wishing Well'). She was incredibly specific. 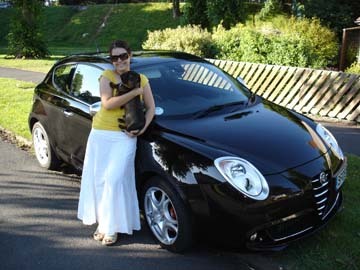 She chose to manifest a Metallic Black Alfa Romeo MiTo. She even selected the model (The top spec 1.4 Lusso model) and picked out which wheels she wanted. She then followed my simple instructions to attract it into her life. Over the following couple of weeks the universe rearranged itself to make her desire a reality. After about 2 weeks she stumbled into a competition to win a MiTo online. It wasn't the same one she'd been focusing on but it was certainly a sign that the universe was listening. 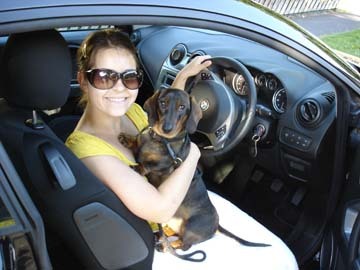 To qualify for the competition she had to take a test drive at her local Alfa Romeo showroom. While she was at the showroom the clerk gave her a form to complete. She filled out her details, handed in her ticket and went on her test drive. When she got home, she focused all of her attention on the competition, which was an online racing game with several stages. The overall winner would get the car and there were several other prizes up for grabs for the leaders of each stage. By the last day of the race it was looking as though she was going to win. She was leading the pack in almost every stage and nothing short of divine intervention would help anyone close the gap. That's when things started getting weird! On the very last day of the competition, her Internet went down. Sky (her ISP) couldn't identify a problem and insisted it was working. Her computer agreed. As far as it was concerned she was online and everything was working fine, but it wasn't. She couldn't get any websites to load and had no way of competing for the final stage. In desperation she did a fresh install of windows. But it didn't help. She figured that it must be her internet connection, not her computer so she drove to her dads home and tried using his computer to complete the race. She couldn't get online there either! Nothing she tried would work and then, just as mysteriously as it'd gone down, her internet came back up. She had a matter of minutes left to complete the final stage. It was close... but it just wasn't enough. Taking a big hit on the final stage dented her overall position and she came in third. She WON two of the items from her wish list! The Unexpected Call - With some VERY Exciting News! About a week later she got a very unexpected call. It was the Alfa Romeo head office calling to congratulate her because she'd just won a brand new car! The form she'd completed at the garage when she took the test drive was nothing to do with the competition she'd entered online. It was for an entirely separate competition! A raffle that she didn't even know existed!!! And she'd just scooped the top prize... the EXACT car she'd placed on her list!!! When Natalie went to collect her prize the local paper were there to take some publicity shots. 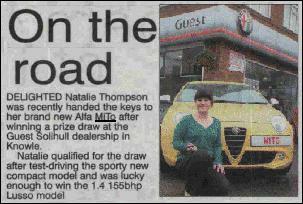 Natalie poses for the local paper having just won a brand new Alfa Romeo! You get EXACTLY What You Ask For! Here's Natalie again, with the actually car she got to take home. A 1.4L Alfa Romeo Lusso with Black Metallic paint and alloy wheels. Everything EXACTLY the same as her wish! Natalie shows off her latest cosmic order - A brand new car! The EXACT make, model. colour and spec that she'd chosen. She now had all of the things on her list! And it'd only been a few weeks!!! Just stop for a moment and imagine how Natalie must have been feeling. Within weeks she'd won a Nintendo Wii, and iPod Touch and a BRAND NEW Car!!! Not only that... but the EXACT car she wanted... the exact make, model, spec and colour! It even had the exact wheels she'd chosen!!! She was delighted.... and STUNNED! I have to admit, I was a little stunned too. I know that my techniques work but I honestly hadn't expected our little experiment to be so successful! It's not just the fact that SHE WON THE EXACT CAR that amazes me. It's the little details of the way it all happened. She found a competition that wasn't quite what she wanted, but it forced her to go the the Alfa Romeo showroom for the test drive, where the next step of manifesting her true desire was waiting. The original competition had various stages with prizes that exactly matched other items on her wish list. She won a Nintendo Wii and an iPod Touch! Her computer went down for no reason at all. Causing her to lose the online race, preventing her from winning the lower spec car. If she had won the first car, she wouldn't have been allowed to win the second (Which was the EXACT car she wanted). Both competitions were being run by the same company and winning both cars was not allowed. During the order process I had her imagine that she was receiving an unexpected call telling her she'd won . If she had won the online game it wouldn't have been a surprise at all because she'd have known she was the winner. The actual call she did receive was very unexpected and she was just as excited in real life as she was when she imagined it just a couple of weeks earlier. Could She Also Won A Holiday? After Natalie had won the car, she decided that she wanted to win a holiday. She wanted to go snowboarding in Austria. Her friends had all recently been away and she hadn't been able to afford to go. So, having enjoyed such astonishing results with the car she applied the exact same technique to manifest a holiday. The previous weekend, Natalie had attended a 3 day 'Flower of Life' workshop. 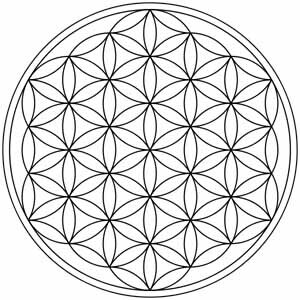 At the workshop she learned about sacred geometry and spent several hours studying the following image; the flower of life. The Flower of Life - The image that Natalie had spent 3 days studying just prior to placing her cosmic order for an awesome holiday! Because this image was so important, she decided that it'd be her sign. Natalie then went through the exact same process that she'd used to win the car. After a few days she stumbled into a competition that looked perfect. The top prize was an all expenses paid luxury snowboarding holiday to Mayrhofen, in Austria. Cutting a long (but exciting) story short... she won the competition! And the holiday was spectacular. EXACTLY what she hoped for and much much more!!! The hotel where Natalie stayed in Mayrhofen is called the Hotel Berghof. It's a beautiful hotel with incredible facilities and excellent food (all things she'd specifically asked for! It even had a special 'boot warming' system so her feet would be nice and cozy in the snow). However, there's one thing that the Hotel Berghof has that you probably won't find in any other hotel in the world. Take a look at the following photograph of Natalie just about to go into the restaurant of her hotel. This is the scene that greeted her as she went down to breakfast every morning! The Flower of Life - The EXACT Sign that Natalie asked for! 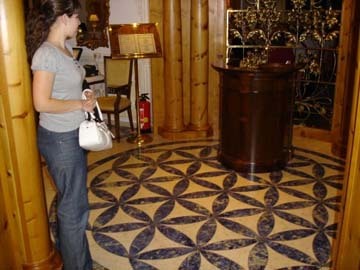 A huge Flower of Life design in the Hotel Berghof in Austria. The hotel she had just won a luxury snowboarding holiday to, thanks to the Law of Attraction! This was the EXACT sign she'd asked for! When she showed me this picture I was totally blown away. I know this stuff works but I never expected that in a million years!!! Natalie is now a manifesting magnet! She has created an incredible life for herself and continues to use my techniques every single day. "I enjoyed reading this book alot! Its an easy read but packed full of important useful tools to help you get on your way to attaining your wildest dreams. I used his techniques to get a brand new car, reconnect with an old friend (not through facebook either lol), brand new DSLR camera, even fine tune my current relaitonship. All the things that have come to me are because of this book. Let me say that Ive been a fan of "The Secret" and all the other law of attraction stuff too. I needed better guidance and a clearer explaination to the "HOW" aspect of manifestation, this book was vital to that. So to Steven Hall, Thank you sir." "I only discovered this book two months ago and am delighted to say it is one of the best books on the subject I have ever read. It is clear the author knows what he is talking about and delivers a positive message explaining exactly how to tune in to the cosmos. It shows you how to use your thoughts so that you know exactly what to think and how to think it so you can manipulate the energy in the cosmos. This goes far beyond some of the inferior books out there that lead you down the wrong path. Watching the author explain things clearer on YouTube has been a real boon. Use it regularly it can help you in the same way it has helped me. If Barbel Mohr is the godmother of cosmic ordering then Steven Hall is the Godfather." "I've been into the Law of Attraction for almost 20 years. I have most of the books on manifestation. That includes books from the "Secret Teachers". And while there are a couple that I really enjoy reading again, Wishing Well is the "end all, be all" - or as close as it gets, to books on manifesting." "If you are having problems getting results with the Law of Attraction, give this book a try! Seriously, there is not another book on the Law of Attraction like this one. It seems that the authors of the other books just assume you are going to "get it" like he or she did. Or you are expected to buy an author's umpteenth book on the subject because his or her former books didn't click for you, but his or her newest one will! The author of Wishing Well is clearly not one of those authors. He knows how to help you get results. This is very stand alone and incredibly comprehensive." "Wishing Well truly sets the bar for all others to follow. It is the first book on manifestation that I ever wanted to write a review on about. After nearly 20 years of reading tons of books about this subject with only sporadic manifesting success prior to this." "Steven has done a great job. I'm on my second read of it and I've picked up more and more of the important stuff from it. I have read books such as The Secret and there didn't seem to be a finish or there was something missing. Steven has hit the nail on the head With this and I will be certainly recommending this to my clients. Good job." "A highly accessible book with a unique mix of cosmic ordering and NLP - a slant you won't find in The Secret. The techniques Steven includes will help readers with a wide range of personal issues to prepare themselves to be ready to receive the things they wish for. This is easily as good as some of Anthony Robbins' stuff minus Robbins' rather intrusive ego." "I cannot understand why every person on earth has not got a copy of this book? For me it is uplifting and so inspirational, even if you do not believe in cosmic ordering it is worth reading just to see how rising from nothing to something can be done, that is the bit that did it for me. As you can see. These techniques really do work. Even if everything else you've tried so far has failed. Wishing Well by Steven Hall - The book that is transforming people into manifestation magnets! Even if they've tried everything else without success! Wishing Well is very easy to read and the strategies that I share with you are very easy to follow. It explains exactly HOW you need to think in order to attract your desire, not just WHAT you need to think. There are some really subtle yet fundamental principles in play when a person successfully manifests something. These subtle variations are what make the difference between success and failure. Wishing Well brings these processes into conscious awareness so that you can finally take full control of the creative process. If everything else is failing and you're feeling frustrated because the Law of Attraction isn't working for you, Wishing Well will show you why... and give you everything you need to start enjoying the kind of success you desire. Plus Much Much More! Absolutely EVERYTHING you need to master the Law of Attraction and begin sculpting the life of your dreams! You can download Wishing Well in seconds and begin transforming your life immediately. I'm a lifetime student of the Law of Attraction and there's one thing I've always firmly believed. When you are ready to take the next step, the way forward will be revealed to you. In other words, when the student is ready, the teacher will appear. Allow Wishing Well to be your guide. To light the way on the next step of YOUR journey. It's no accident that you are here. The Law of Attraction is a law. You have put out an intention to find a solution to the frustration you have been experiencing. You have desired a way of making the Law of Attraction work for you, even though The Secret didn't. Wishing Well is the answer you have attracted into your life. Recognize this opportunity and take action. To claim your copy of Wishing Well, for immediate download (So you can start sculpting the life you truly desire right now) click on the order button below. First published in 1912 as a 24 week course. To keep it out of the hands of the masses, it cost the equivalent of $100,000.00 USD in today's money. Even so, by 1933, 200,000 copies had been sold. Later that year it was banned by the Catholic Church. This book was considered so dangerous because it redistributes the balance of wealth and power. What you'll discover in this book was only ever meant to be revealed to the most important people at the very top levels of the pyramids of power. Originally published in 1902, this book is considered by many to be the 'seed' that began the entire self help movement of the 20th Century. It is beautifully written and takes the reader on a 'rose tinted' journey of the world of self creation. As a man thinketh explains that thoughts become things and teaches you how to think in order to become the person that you aspire to be. "Today, we are where our thoughts have taken us, and we are the architects of our future." First published in 1937 after Hill spent 25 years studying the richest minds in the world, Think and Grow Rich contains the legendary 13 steps to riches - An action plan that is solely responsible for creating more millionaires than any other book ever written. Many of today's millionaires confess that they owe their fortune to the content of this book, and proudly admit to having read it at least twice. Almost every modern book on the law of attraction, including the hit movie 'The Secret', is based on the wisdom contained within these pages. You can download your copy of Wishing Well and your 3 bonus ebooks immediately after purchase so you can start reading them straight away. Your Order is 100% Risk FREE! Thank you for allowing me to be a part of your journey! I wish you every success in life and beyond. PS. Wishing Well makes it easy for anyone to begin living the life they truly desire. Even if you've tried everything else and failed I personal guarantee that Wishing Well will work for you. If you're not totally delighted with the results you achieve by following my method I'll very happily refund every penny you paid. No Questions Asked. PPS. There are NO accidents. You are here because you are ready to end the frustration. Wishing Well is the answer to the question you have been asking. By the Law of Attraction it has come into your life. Now claim it and take action. All prices are in USD. Orders are accepted globally. The price will change to your local currency (at the current exchange rate) on the next page before you process your order. All orders are processed using secure 128bit SSL technology via ClickBank. 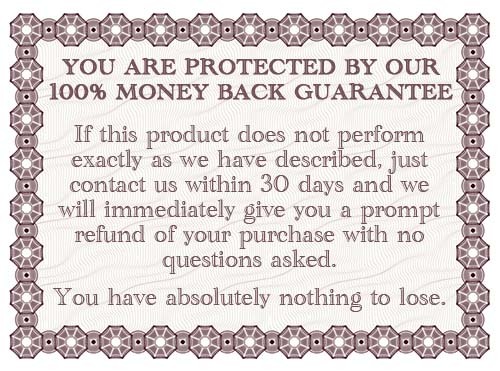 We offer an unconditional 60day money back guarantee. Orders accepted 24 hours a day 7 days a week. 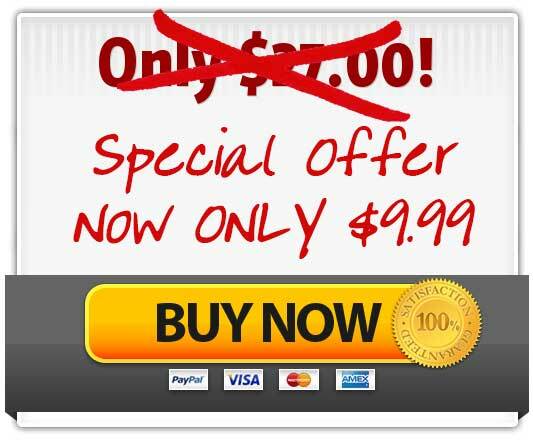 Upon completion of your order you will be able to download your purchase immediately.